Author: Eidson, Bill Set In . . .
Ex-DEA Agent Jack Merchant is living out his precarious retirement on the docks of Charlestown, Mass., surrounded by the revenge-minded dealers and punks he used to put away. All he's got is his sloop, LILA, but soon enough he gets a visit from the repo man. Except the repo man's a woman, Sarah Ballard. Her proposition: they've got a week to track down a rich couple who've disappeared with their yacht. Find it, and Merchant can keep his boat. The trouble is, they're not the only ones looking... A dark tale with enough kinks and twists to keep you guessing to the last page, THE REPO is the first book in a series featuring Jack Merchant and Sarah Ballard. 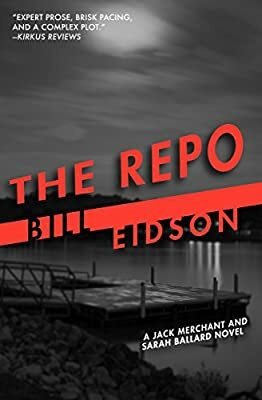 "With THE REPO, the debut of his Jack Merchant-Sarah Ballard series, [Eidson] proves high praise is warranted. He writes with appealing aplomb. His dialogue has the ring of overheard conversation, and we feel the breeze and smell the sea air as his characters pursue their prey. And he manages well the stories-within-the-story, as he introduces us, in compelling detail, to Merchant and Ballard, who may need each other more than they know." “The partnership and eventual passion between Jack and Sarah, and the boat's disappearance and the demons from the past that possess both detectives merge beautifully, creating a convincing landscape of deception and self-doubt...there is promise here of a fine series to come. "Eidson quickly puts his own original brand on what looks like the start of a promising series...much of the book's strength comes from the way Eidson makes [Sarah Ballard's] toughness and coldness inevitable and convincing. There are also some unusually interesting minor players and assorted villains, as well as several original and violent moments of action, many at sea."